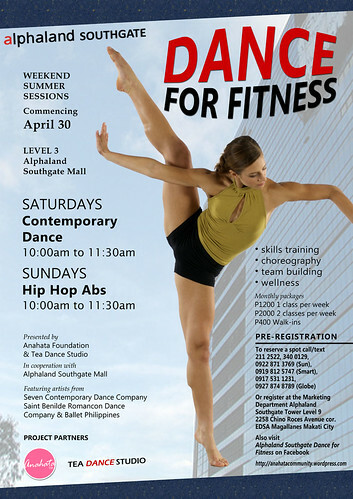 Skills training, choreography, team building, wellness – Weekend summer sessions commencing Saturday, April 30 2011 from 10:00am until 11:30am at Level 3 Alphaland Southgate Mall featuring contemporary dance on Saturdays and a hip hop style abs workout on Sundays. A collaboration presented by Anahata Foundation and Tea Dance Studio in cooperation with Alphaland Southgate Mall featuring artists from Seven Contemporary Dance Company, Saint Benilde Romancon Dance Company and Ballet Philippines. 3F Zeta Building Salcedo St.